Airbus Defence and Space has signed a contract with the European Space Agency (ESA) for an on orbit demonstrator within the frame of ESA’s Advanced Research in Telecommunications Systems (ARTES) Pioneer program. The on orbit project (known as IODA – In Orbit Demonstrator by Airbus) will develop the key elements, including infrastructure (spacecraft, payload and ground segment), launch a first satellite and validate the entire system in a multi-mission scenario. The final objective for the IODA is to offer a one-stop-shop service for In Orbit validation and/or Proof of Concept (whether technology or service based), in a real operational environment leading to a greatly improved prospect of market take-up. ESA’s Telecommunications program seeks to enhance the competitiveness of European industry by promoting the use of satellites in such functions as broadcasting, multimedia and mobile communications, data relay, search and rescue and aviation services. 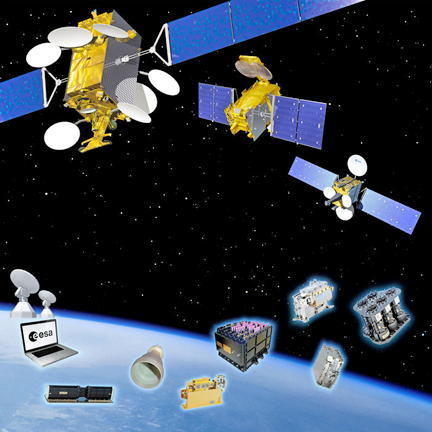 ESA Telecommunications supports general telecom R&D through various program lines of its long-running ARTES (Advanced Research in Telecommunications Systems) initiative. Artistic rendition is courtesy of ESA-P. Carril. ESA’s Pioneer Partner program aims to facilitate the emergence of Space Mission Providers (SMP) who can provide timely, cost-effective opportunities for public and private customers to access space. Right - Magali Vaissiere, ESA’s Director of Telecommunications and Integrated Applications. Arnaud de Rosnay, the Head of Telecom Satellites in Airbus said that this partnership with ESA should greatly facilitate future on orbit validation of new concepts, systems and technology relying, on the proven technology that will be OneWeb. It be available to all European spacecraft manufacturers as well as be a resource for new space downstream entrepreneurs to prove and de-risk their new technologies and mission concepts in orbit. Airbus' aim is to greatly enhance mission validation for existing and new entrants in the space sector offering advice and expertise covering everything from payload architecture, to innovative and automated integration processes as well as ground segment support, operations and end-to-end system support. 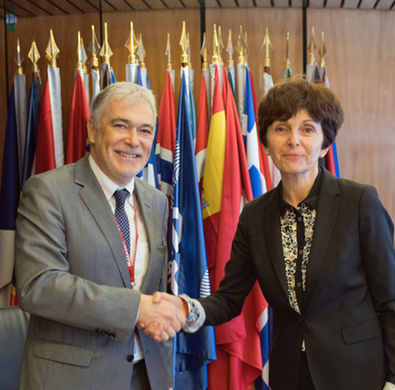 Magali Vaissiere, ESA’s Director of Telecommunications and Integrated Applications, added that commercial European entities will have the ability to offer fast and affordable access to space to public and private customers in the field of satellite telecommunications. This Pioneer program creates new opportunities for both established and new players in the fast-changing and competitive SATCOM market. The Airbus IODA project confirms the strong support of ESA's Member States and industry to this initiative.